BY CAPTURING NATURE’S IMPERFECT BEAUTY, WE CREATE AWE-INSPIRING YET “PRACTICAL” OUTDOOR ROOMS. One of the best aspects of living in the Pacific Northwest is the beautiful scenery. We’re surrounded by water and gorgeous landscapes — and nature not only inspires our design choices but also provides additional living spaces. When approaching a project holistically, we look for ways to take advantage of these “bonus” spaces to create an extension to the indoors. The idea is to bring the outdoors in, and vice versa — we want to pull the eye to the tranquil outdoor setting where intimate and comfortable “rooms” can be created both for relaxing and entertaining friends and family. The exceptional scenery of Colvos Passage, along with the shape of the site, were the inspiration for this waterfront home design. In creating this outdoor room, the goal was to provide privacy and block neighboring properties from sight while opening up the gorgeous vistas to full views — giving nature center stage. The patio is tucked between the living room and the master suite. Our vision called for a space that felt connected to the living room so that summer entertaining could be extended to the outside. From the vantage point of the living room, this outdoor nook draws the eye, inviting guests to come outside and mingle. A stone, vertical-style fireplace complements the contemporary design of the home while creating a warm ambiance. The vertical-style Rumford “box” fireplace reflects the fire through steel “logs” decorated with laser cutouts — setting the perfect mood for a cozy conversation around the fire. Just as we would in interior design, we played with bold colors — choosing bright red for the furniture cushions — in order to provide contrast with the gray concrete and green plants. Hanging outdoor lights and indirect lighting from other areas add a soft vibe to the setting. 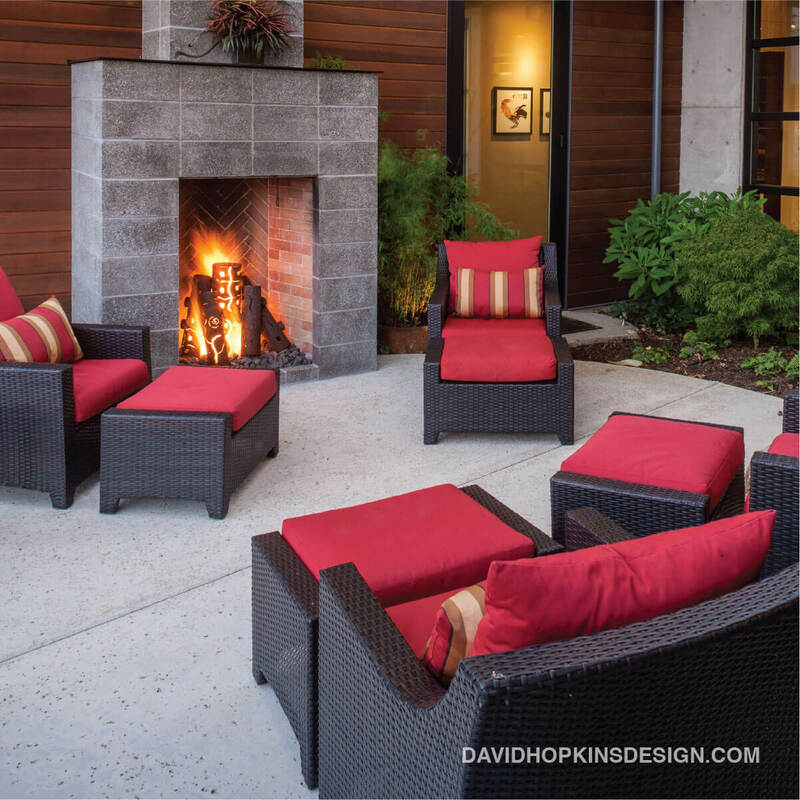 At David Hopkins Design, we strive to create spaces that are not just beautiful and artful but also sustainable and efficient. Which is why we love the idea of a room serving multiple functions. Keeping that versatility in mind, we designed this outdoor room so that with a simple change — removing the chairs and bringing out a dining table — it could instantly become a plein-air dining room for an intimate party. As designers, we are inspired by many things, including our clients’ and our own world travels. But there’s something awe-inspiring in the simple, imperfect beauty of nature — and if we can capture that majestic, quiet brilliance both indoors and out, we know we have succeeded at our jobs.